New York, NY—In honor of the brand’s founding designer, Scott Kay is partnering with The Fashion Institute of Technology (FIT) for the second consecutive year to hold a brand-inspired contest for jewelry design students. During the fall 2017 semester, second-year jewelry design students designed a men’s jewelry set of three pieces from four options: ring, bracelet, necklace, and/or cufflinks. Under the supervision of FIT jewelry design faculty member Alison Nagasue (one of Centurion’s 2017 Emerging Designers) and Alex Nazarov, coordinator of student contests, the students were challenged to tap into their creativity to design original pieces for Scott Kay. Students presented technical drawings, measurement details, materials and color options, as well as mood boards detailing their inspiration, for the first round of judging. Judging was based on overall design, originality, and creativity. In late January, Scott Kay will host an intimate dinner for the five finalists at which they will present their final drawings to the judging panel and the top winner will be announced. The winner will receive $3000, the second and third runners-up will each receive $1,000, and fourth and fifth runners-up will each receive $500. All five finalists will be featured on Scott Kay’s website. The judging panel is comprised of executive members of the Scott Kay team, as well as Nina Bruno, buyer of men’s jewelry at Macy’s, Victoria Gomelsky, editor-in-chief of JCK magazine, and Robert Quick, associate editor at Essential Homme magazine. New York, NY—Tiffany & Co. has been named as Luxury Daily’s 2017 Marketer of the Year for its marketing makeover under newly installed chief artistic officer Reed Krakoff. Luxury Daily’s Luxury Marketer of the Year award is based on luxury marketing efforts with impeccable strategy, tactics, creative, executive and results. All candidates selected by the Luxury Daily editorial team and from reader nominations had to have appeared in Luxury Daily coverage this year. 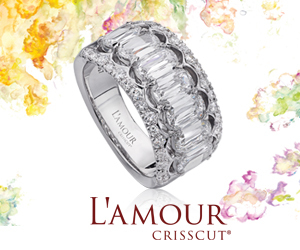 The jeweler is slowly rebounding from a period of tumult and upheaval, during which it turned over leadership in both the CEO and design offices. In January, Reed Krakoff was named creative director and chief artistic officer following the departure of Francesca Amfitheatrof, while Alessandro Bogliolo was named CEO following the departure of Frederic Cumenal. Krakoff made his name at Coach, while Bogliolo’s pedigree includes Diesel and Bvlgari. The combination of the two—who understand both accessible and ultra-high luxury—appears to be working. The brand’s personality-driven marketing, featuring such notables as Lady Gaga (top of page), Grace Coddington, Zoe Kravitz, and other women of achievement, has resounded positively with consumers and Luxury Daily credits that plus a robust social media strategy for the brand’s win. New York, NY—Bulova is collaborating with the American Cancer Society and the Global Film Fund to celebrate the inspiring story of Lady Ganga, aka Michele Baldwin, a 45-year-old mother of three diagnosed with late-stage cervical cancer. The disease takes the life of more than 270,000 women every year. Baldwin/Ganga traveled to India to spread awareness about the disease that would eventually kill her, but first she traveled down the Ganges River more than 700 miles by paddleboard, breaking a world record in the process. In the Global Film Fund-supported, award-winning short documentary, “Lady Ganga: Nilza’s Story,” directed by Frederic Lumiere, viewers follow Michele’s journey and see how her story inspired some of the world’s most vulnerable women to get screened for cervical cancer, including a mother named Nilza, whose life was spared, thanks in great part to Lady Ganga. This inspirational film is free for all to watch, subtitled in more than a dozen languages at LadyGanga.org. The women’s story inspired the brands to support this worthy cause and join this worldwide movement to eliminate cervical cancer: #LADYGANGA. 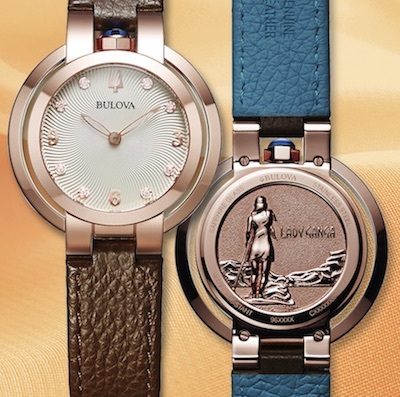 Through the unveiling of a new Rubaiyat Special Edition ‘Lady Ganga’ timepiece, Bulova joins the effort to support cervical cancer awareness and help in the fight against it. The special edition watch stems from the recently launched women’s Rubaiyat Collection, featuring a rose gold-tone stainless steel case and blue spinel cabochon crown at the 12 o’clock position. 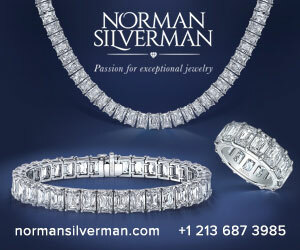 The piece holds eight diamonds individually hand set on a textured silver-white dial, with curved sapphire crystal. The watch is complete with a brown leather strap lined in teal, with a dynamic dye-struck custom ‘Lady Ganga’ case back. Bulova will make a 10% contribution to the American Cancer Society with every purchase of the ‘Lady Ganga’ Special Edition timepiece. The brand hopes to help save lives, ensure quality of care for all, and support essential research that furthers the fight against cervical cancer. To learn more about Michele’s journey visit LadyGanga.org or www.bulova.com.